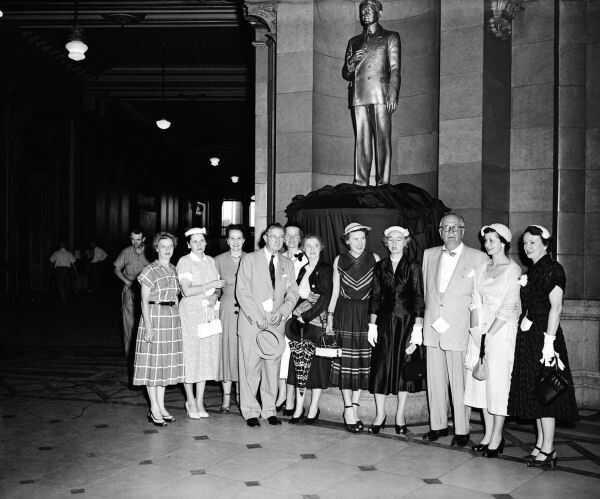 A photo of the dedication of the Richard J. Barr statue in 1953. The columns of the north portico may be seen through the windows at the end of the hall. The Comptroller's office was constructed in this area in the 1970's.Photo by Eddie Winfred "Doc" Helm, courtesy Illinois State Archives. 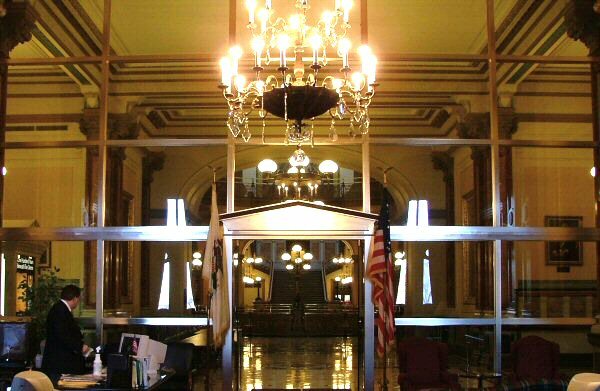 In this photo you are seeing the original main entrance to the Capitol behind the glass doors of the Governor's office. 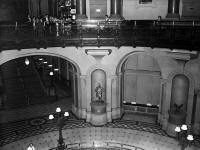 The doors now open to a second floor balcony, but in the early days of the building they stood at the top of a staircase on the east side of the Capitol. 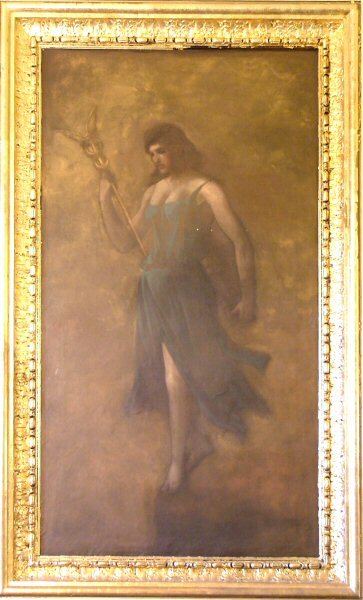 Four allegorical paintings were placed on the walls in the entrance between the executive offices of the Governor and Secretary of State. These were painted by Matt Morgan of Cincinnati, Ohio. Art - North wall inside the Governor's Office. Literature - South wall inside the Governor's Office. 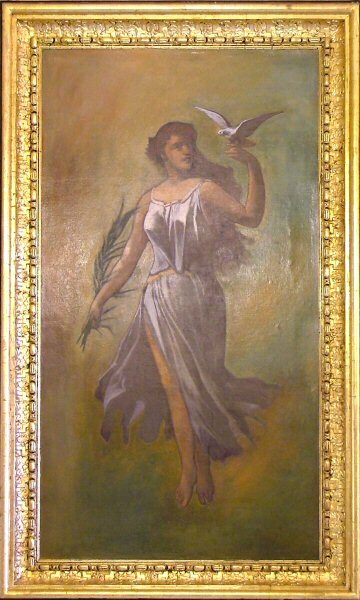 Peace - North wall outside the Governor's Office. War - South wall outside the Governor's Office. Photo courtesy of the Illinois State Historical Library. The photograph on the left is in the collection of the Illinois State Historical Library and it brings to light some interesting facts. Notice that the statues are all white. The statues of Lincoln, Douglas, and Gov. 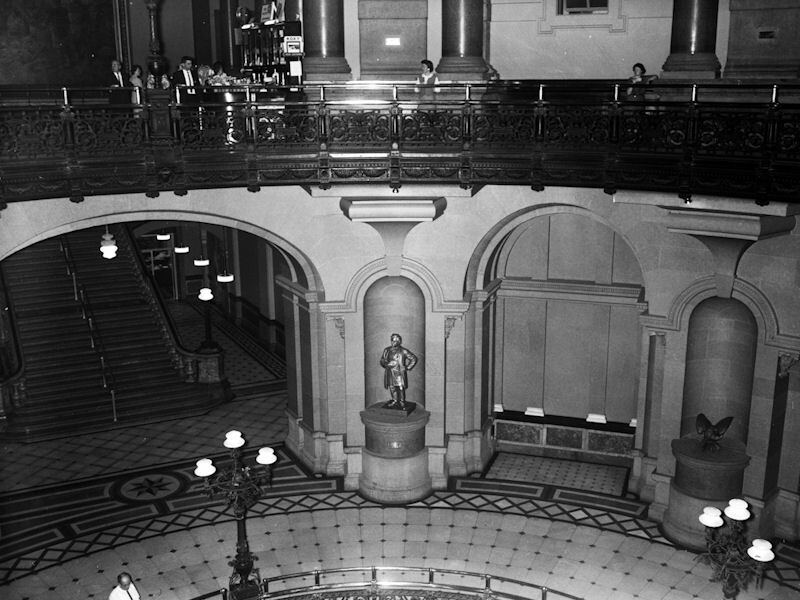 Wood are today located in alcoves (pictured below) around the second floor rotunda and painted bronze, matching the other statues in this area. Also note the radiator covers along each side of the hallway and ornate ceiling decorations, which have been painted over. Henry T. Rainey was born in Carrollton, Illinois on Aug 20, 1860. After college and law school, Mr. Rainey returned to Carrollton and commenced his practice. He resigned as Master in Chancery for Greene County when he was elected as a Democrat to the U. S. House of Representatives and served continuously until his death, except for one term when he unsuccessfully contested the election of his opponent. 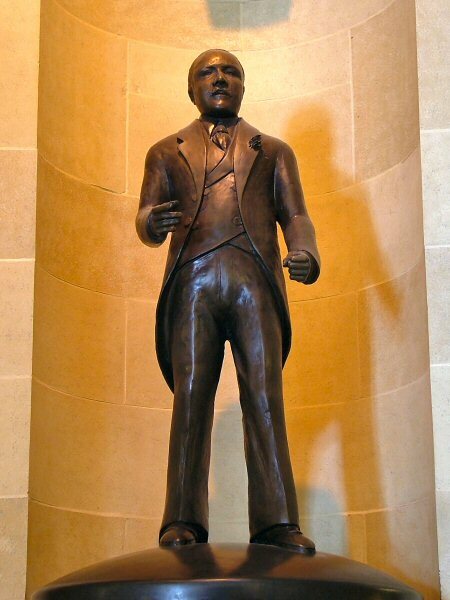 Mr. Rainey was elected Speaker of the House for the 73rd Congress and held that position when he passed away in St. Louis Mo. on August 19, 1934. His funeral was held at Walnut Hall, the Rainey’s rural Carrollton estate. President Franklin D. Roosevelt was among the estimated 35,000 in attendance. Born in Pekin, Il. 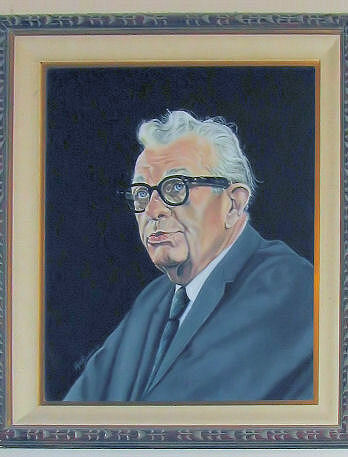 in 1896, Everett Dirksen served in World War I and held several positions upon his return. He was admitted to the bar in 1936 and began practicing law in Pekin. Dirksen was elected to the U. S. House and served continuously from 1933 – 1948. He was not a candidate for re-election in 1948, but was elected to the U. S. Senate in 1950 and served there until his death in 1969. 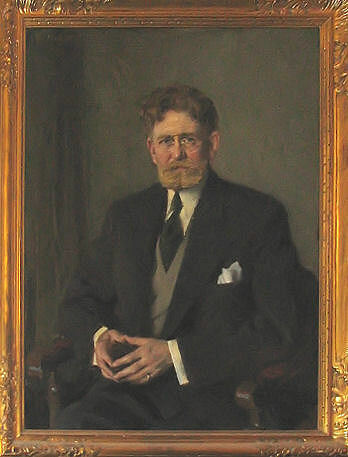 He served as Republican Whip and later was Minority Leader. Dirksen was famous for his booming, deep voice and actually recorded several spoken word albums. James Hamilton Lewis was born in the state of Virginia and after several moves, a term as U. S. Representative from the state of Washington, and service in the Spanish-American War, he moved to Chicago in 1903. 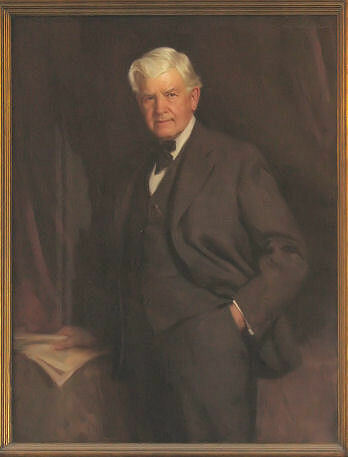 A Democrat, Mr. Lewis served as U. S. Senator from Illinois from 1913 – 1918 and from 1930 until his death in 1939. Lewis was known as “J Ham” or “Pink Whiskers,” a reference to his once flaming, later graying red beard. 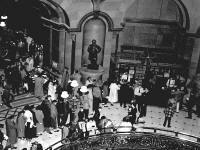 His funeral services were held in the chamber of the U. S. Senate. Leslie C. Arends was born in Melvin, Il. on September 27, 1895. After college Mr. Arends served in the Navy during World War 1, returning to agricultural and banking pursuits upon completion of his service. 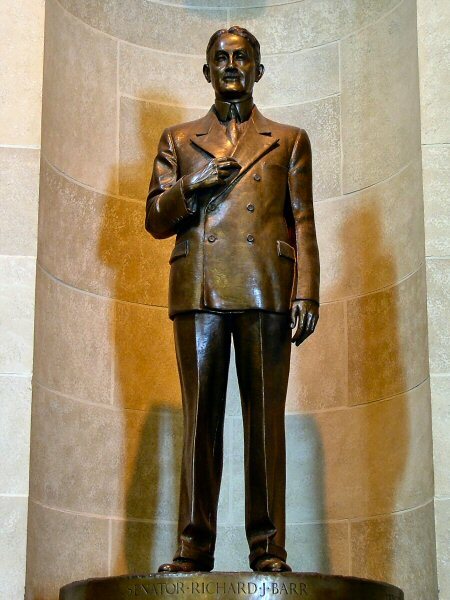 He was elected to the U. S. House of Representatives and served continuously from 1935 – 1974, holding several Republican leadership positions during his tenure. Mr. Arends passed away in 1985. 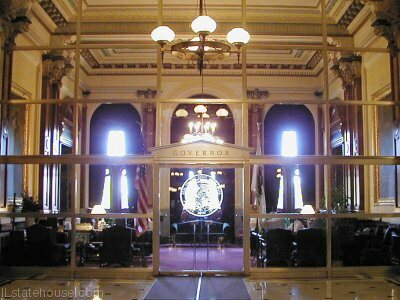 Click here to visit the Governor's Office. 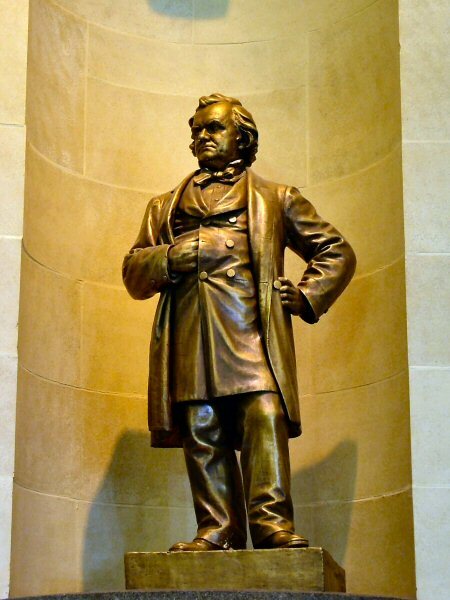 Designed by famous Lincoln sculptor Leonard Volk, this plaster statue along with the statue of Stephen A. Douglas, was unpacked on January 7, 1877 and placed on a wooden box in the east hall of the current second floor. 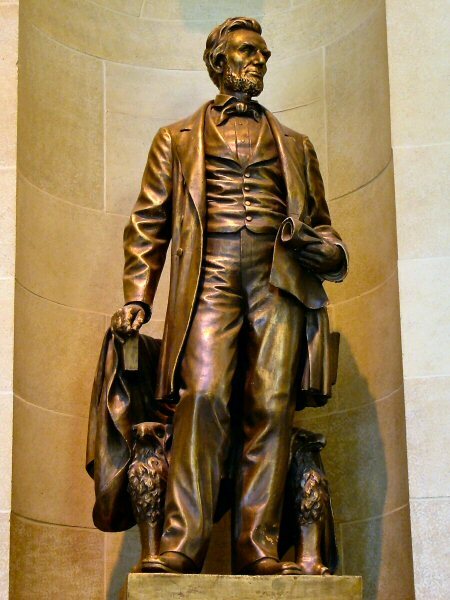 Designed by famous Lincoln sculptor Leonard Volk, this plaster statue along with the statue of Abraham Lincoln, was unpacked on January 7, 1877 and placed on a wooden box in the east hall of the current second floor. 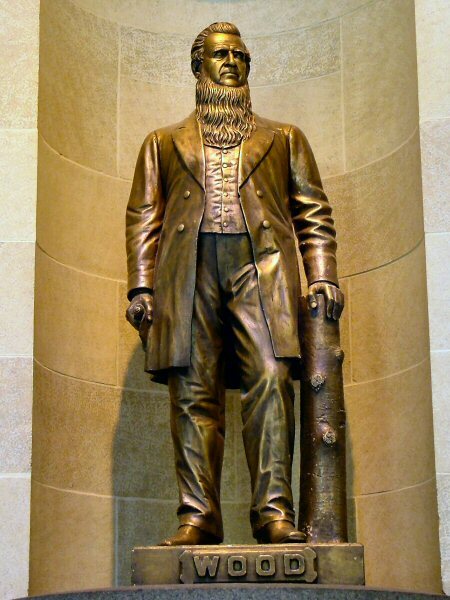 This statue of Illinois' 12th Governor was sculpted by Cornelius G. Volk, older brother of Leonard. It was donated by the people of Quincy, Wood's hometown. 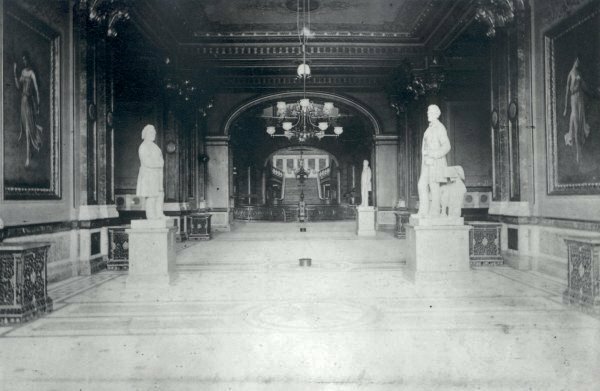 The three Volk statues were moved from the floor to pedestals in 1894. June 7, 1939. Sculpted by Frederick C. Hibbard. 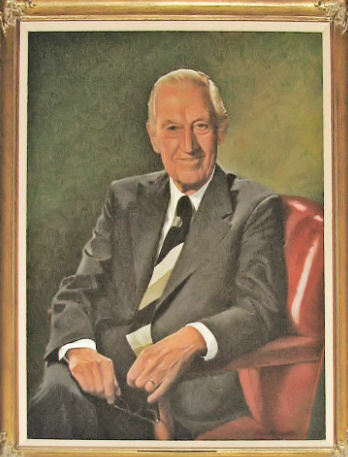 Shanahan was a member of the House for 42 years and was elected Speaker 6 times. June 26, 1953. Sculpted by Tryg A. Rovelstad. Barr served as a State Senator for 48 years. January 14, 1976. Sculpted by Abbot Pattison. O'Neill was the first woman elected to the Illinois House. 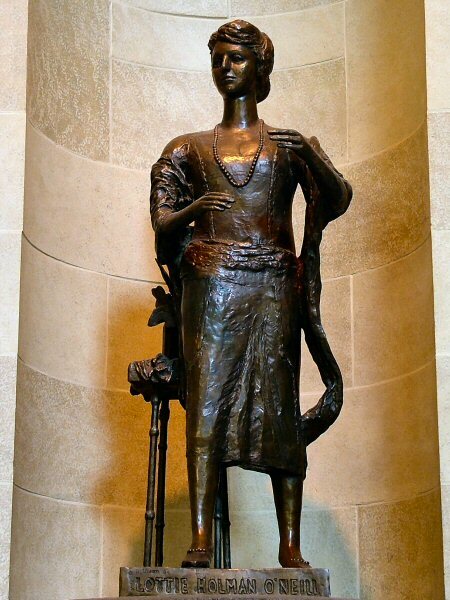 Starting in 1923, she served 38 years in the General Assembly. June 23, 1981. Sculpted by Peter Fagan. Daley served in the General Assembly for 10 years and was also State Revenue Director. 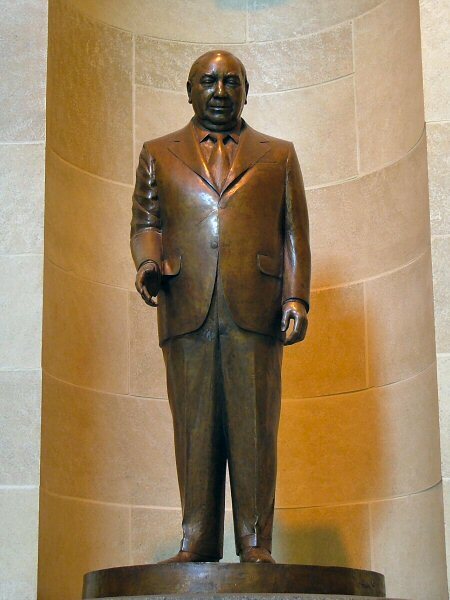 He was mayor of Chicago for over 21 years, until his death on December 20, 1976. June 7, 1984. Sculpted by Richard Hunt. Roberts was a Republican attorney from Chicago who was the first African-American to serve in the Senate. 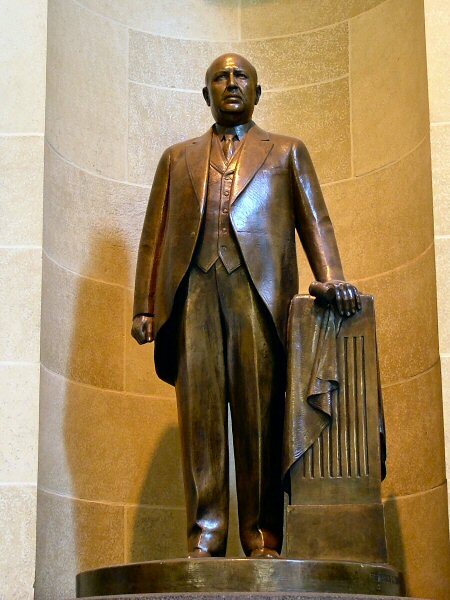 He was elected three times to House and twice to the Senate before his death in 1937. 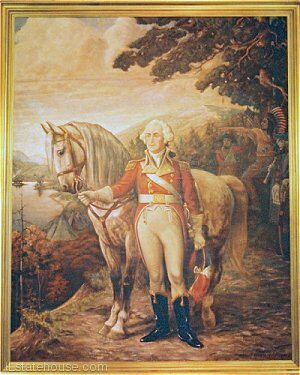 The painting of George Washington that is on currently on display between the statues of Stephen A. Douglas and Adelbert Roberts was donated to the State of Illinois by Mr. and Mrs. August C. Meyer of Champaign, Illinois in the early 1970's. 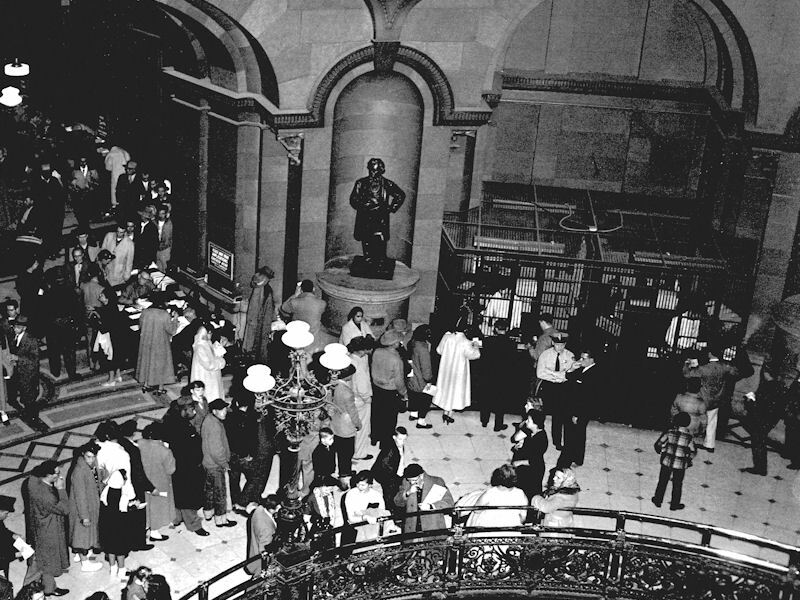 Pictured to the left of the painting is a 1956 view of the alcove where the painting hangs. People can be seen purchasing license plates at a counter operated by the Illinois Secretary of State's Office. On the right side is a photograph of the same area taken in 1962. Notice the empty wall where the painting is now exhibited and the eagle statue in the right niche, which has been replaced by the statue of Adelbert Roberts. Also of note is the third floor refreshment stand visible above the Douglas statue. Black and white photos by Eddie Winfred "Doc" Helm, courtesy Illinois State Archives. Click here to visit the The Secretary of State's Office, which is located on the east side of the south corridor. 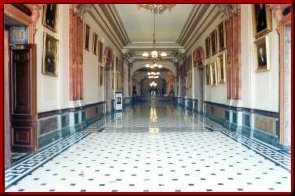 This link will take you to a page dedicated to Room 212, formerly the Illinois Supreme Court chamber, now a Senate committee room. 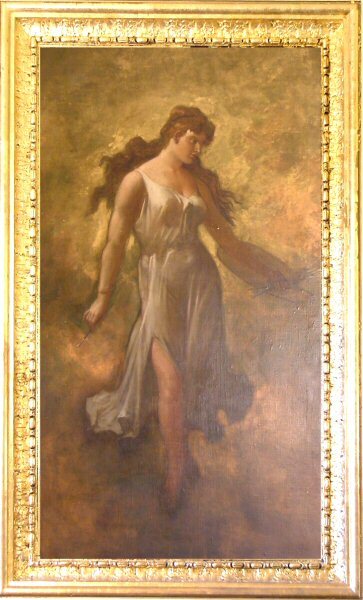 The south hall of the second floor is lined with paintings of former Illinois Governors. Click here to visit the Hall of Governors. 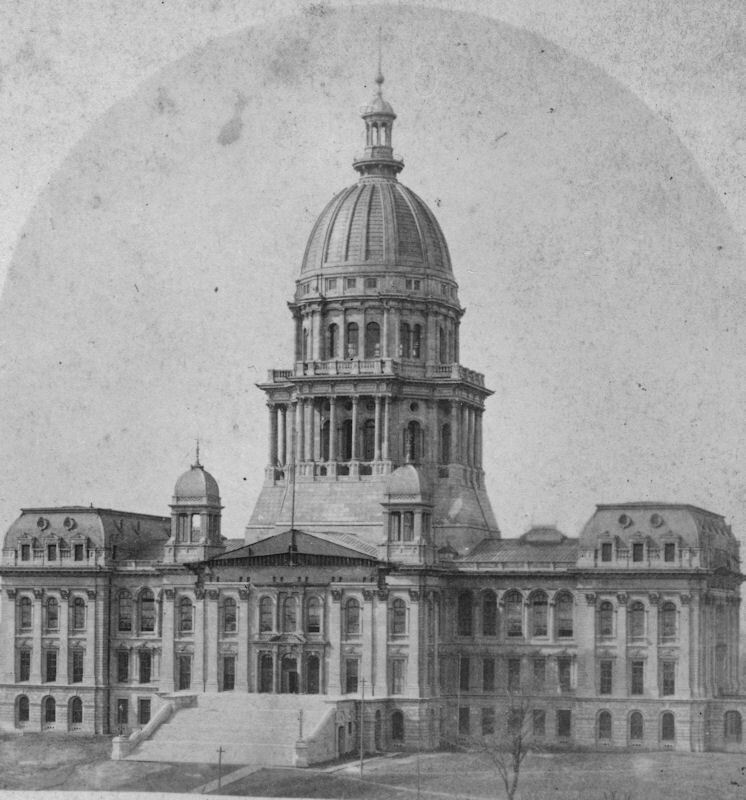 Illinois Statehouse architect Alfred Piquenard was contracted to build the Iowa Capitol in 1870. 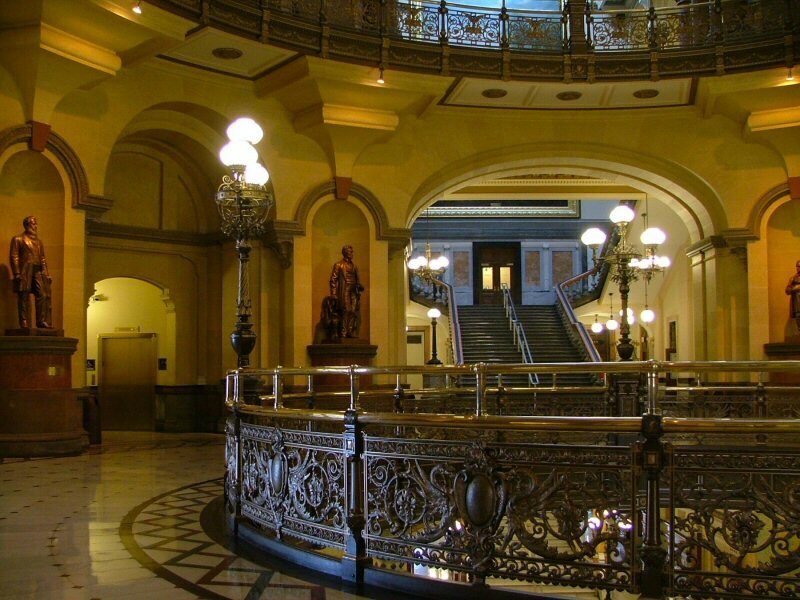 During an 1874 inspection of the Illinois construction, Iowa Governor Cyrus Clay and his Statehouse Commissioners were quite impressed and opted to use many of the novel features of the Illinois Capitol. 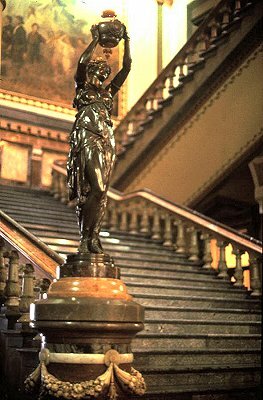 They returned to Iowa with two beautiful statues designed for the Grand Staircase by Piquenard, because the scantily clad ladies were deemed inappropriate by the more prudish Illinois Statehouse Commissioners. This information is from an article by Dr. Wayne C. Temple in the Capitol Centennial Papers. Room 218 - Former Law Library? Room 218 on the north side of the west wing of the second floor was most likely the law library and perhaps also the apartment of the Attorney General, although no documents exist to prove this. 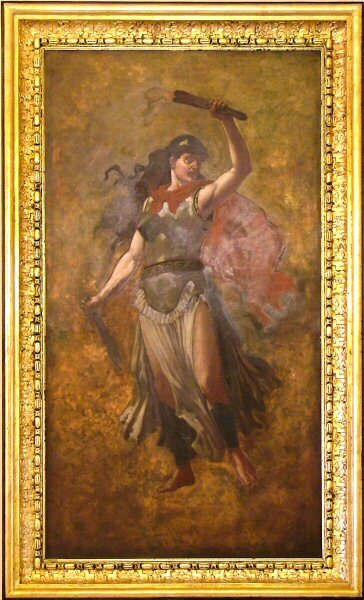 These law themed paintings are located on the south and west walls about 15 feet above the floor. This room is now a Senate office.